Ward is a force to be reckoned with, a literary power house whose books everyone should read. I read the third book in this trilogy, the National Book Award winning Sing, Unburied, Sing last summer, and then I knew I had to read everything else she had ever written. When I saw that this title, the first in the same trilogy, was being released again and that review copies were available, it seemed like Christmas. Many thanks to Net Galley and Scribner. This book was released again last week and is now for sale. Twins Christophe and Joshua are graduating from high school, exuberant and full of plans for the future. The sole source of tension, a longstanding one that is integral to their deepest senses of self, is whether their mother, Cille, will put in an appearance. She lives in Atlanta, but she might come home to see them walk. Then again, she might not. They assure each other that really, only Ma-mee matters. Ma-mee is their grandmother, but she is the one that raised them since they were tiny; in fact, their grandmother really wanted them, and their mother really didn’t. When their graduation present arrives—a used but still nice car for the two of them to share—they snicker to one another and say this means Cille isn’t coming. She’s done with them for sure now, bought her way out of a personal appearance. But Joshua still hopes; Joshua still longs for her. Their father, Samuel, lives locally, and it is at him their anger is unequivocally directed. Known as the Sandman, he is beneath the contempt of even the most humble local citizens, a meth addict with a mouth full of rotting teeth that will do anything, no matter how humiliating or unprincipled, for even the smallest sum of drug money. Samuel has never pitched in a dime to help Ma-mee raise them, but now that they are adults—at least officially—he has come sniffing around. The twins’ rage toward him is measureless. The thing that makes this story so visceral, so moving, and so deeply absorbing is the character development and the complexity of the relationships between and among the twins and the two women. Cille’s insensitivity makes me punch my pillow a couple of times. Can she not see how little food they have, despite their proud claim to be fine, just fine? Every gesture, every word is weighted with meaning. No statement, no financial transaction, no arrival or departure is without weight. The blues festival Cille has planned to attend as part of her vacation—to which the twins are of course not invited—and the money carelessly dropped on a rental car could go so much farther to help her elderly mother, who is legally blind now, but instead she leaves Ma-mee to her eighteen year old sons to care for. They both assume they will be able to get jobs once they have high school diplomas; they have no police record, and they’re not too proud to apply at fast food outlets and other retail locations. And so “reality [rolled] over them like an opaque fog…” Joshua, the lighter of the twins, is hired, but Christophe can’t get a job there or anywhere else. And so a new division is born, and a new source of tension develops. Joshua feels guilty, apologetic, and yet as time goes on, as he sweats for long hours in the Mississippi summer sun carrying chicken guts and who knows what else, his brother absents himself and comes home high; he sleeps into the day, and sometimes shows up late to pick Joshua up from work. He’s given in to his cousin’s invitation to deal drugs, and that puts everyone at risk. Over and again, I can see that the twins are still children. Young men don’t grow up quickly anymore. They are children emotionally and developmentally until their mid-twenties, and yet this burden is Joshua and Christopher’s to carry; the choices they make are not the choices of criminals or saints, but the choices of children. Yet they carry the burdens of men, and they are aware this is because of the defection of their mother. Ward’s more recent work is even better written than this one, and yet it’s harsher, too; I had to put it down from time to time, because it was getting dark out there. This story in contrast is one I could read for hours on end, and I did. There’s violence aplenty as well as tragedy, but this is a reality I can look at without flinching, and that’s worth a great deal too. Highly recommended to those that love outstanding literary fiction, African-American fiction, Southern fiction, and family stories. I’d been looking forward to reading this book, and I’d been dreading it. The fact that Morrison is such an outstanding writer makes the pain in her prose more tangible than most. One doesn’t feel the pain of a character; one feels the pain of a friend. And so even though I have three of her books I haven’t read yet sitting on my to-read stack, challenging me as if to ask why I had skipped them so many times when it was their turn, I still asked for this hot-off-the-presses title for Mother’s Day. When I opened it, my son (the eldest, the one who worries about me now and then) said gently, “So Mom…you know…have you read Toni Morrison? Because…” And I told him I had, and I knew, and that I would also read something light or funny during the time I read this one, to break up the horror. Going into it with that level of caution, not unlike going out to pick flowers when I was seven, wanting the heavenly fragrance of the posies that grew in our California yard but not wanting to encounter the rattlesnakes that sometimes lay coiled in their vines, I was actually pleasantly surprised. Because although there is certainly plenty of pain to go around, our protagonist advocates for herself; she takes charge. I came away feeling as if there was more that was good in the world, and in people, than bad. And when we go to the contest for best first lines, hers should be a contender, particularly when one considers context: “It‘s not my fault.” Lula Ann’s mother was horrified at the very sight of her newborn: “Midnight black, Sudanese black.” She and her husband were both light-skinned people, “What we call high yellow”. It’s all there on that first page: betrayal, betrayal, betrayal, and in the case of Lula Ann’s parentage, betrayal suspected (by her father) and denied (by her mother) and a marriage undone. I think of my own family; when I was born, everyone in my family, and all of the photographs carefully lined up of those that had gone before, were of the super-pale variety found on the British Isles and in Northern Europe. Turn us loose in the sun for twenty minutes without sunscreen and we look like a family of lobsters. And yet, over the generations, we have chosen to marry and procreate with people of color. Then, since there were already Black and Asian children in the family, the family members that could not have children adopted two children, the first one white, the second Black. At family parties, the Black relatives all congregate for part of the festivities, then move out to rejoin the rest of us. And I know it’s not at all the same as for Morrison’s fictional family, because Lula Ann’s parents didn’t have the choice to be all white, or to bring people of color into the family. My generation and the Caucasian members of subsequent generations have had the power to choose who would be in their immediate family; of course, our Black and Asian relatives also had a choice of who to marry, but they also had less power socially and economically, so again: not the same thing. They have none of the history, none of the rage that is inherent of being a son or daughter of a grandson or granddaughter of slaves. Lula Ann is instructed to call her mother “Sweetness”. There’s deniability there. Her mother doesn’t want people to think…to think something is wrong. She grows up, ironically, to become a model who is prized for her dark skin. She turns it into a brand, with help from a friend, and wears only white, using the name “Bride”. White clothing day in, day out, to emphasize her darkness. She owns a cosmetic brand but wears no cosmetics. She needs to appear pure in order to carry it off. She has a man, until he finds out the secret that is buried in her past. Actually, he doesn’t know the whole thing, and that’s where the trouble begins. 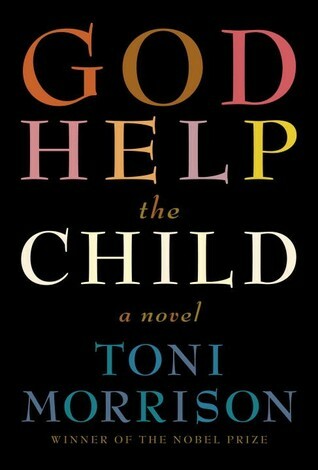 Literary fiction often carries power and authority that nonfiction can’t convey, and so it is with God Help the Child. I suspect professors that teach African-American Studies are putting it on their required reading list, and that’s a great thing, because there is so much to think about packed into this slender volume. If you don’t have this book, get it and read it. If you don’t have the money, go to your local library and put yourself on the waiting list. And if it is assigned to you to read for a class, please, please, don’t buy a paper to get out of reading it (and don’t copy this blog post and turn it in as if it were your own). Don’t read the Cliff Notes. Read the book. It is both accessible and potent. It may be the most important book you read all year, and you won’t forget it.